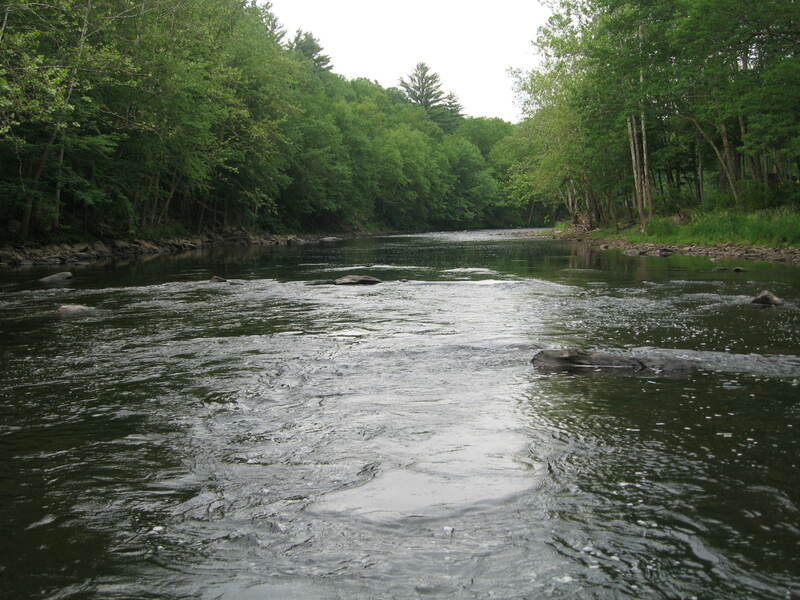 Regulate the river temperature in the Lackawaxen River below the Lake Wallenpaupack hydroelectric discharge during summer to mitigate stressful riverine conditions for trout. 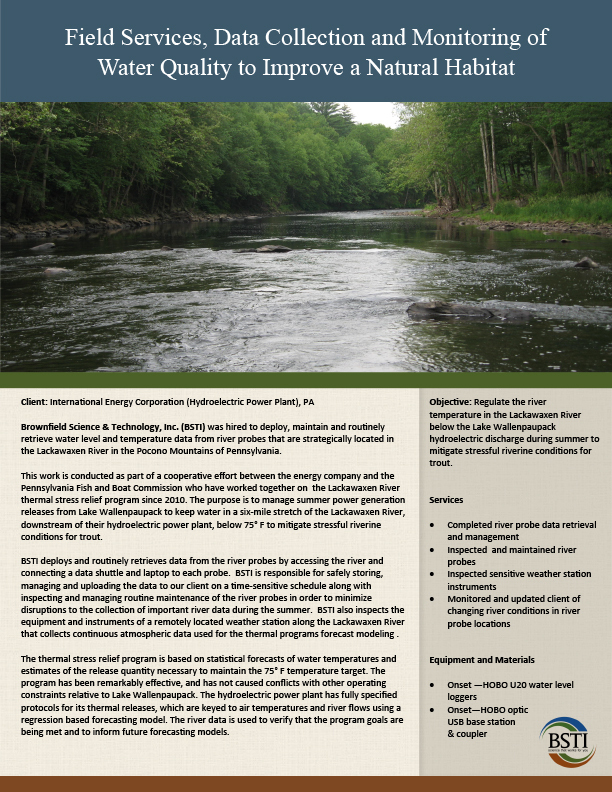 Brownfield Science & Technology, Inc. (BSTI) was hired to deploy, maintain and routinely retrieve water level and temperature data from river probes that are strategically located in the Lackawaxen River in the Pocono Mountains of Pennsylvania. This work is conducted as part of a cooperative effort between the energy company and the Pennsylvania Fish and Boat Commission who have worked together on the Lackawaxen River thermal stress relief program since 2010. The purpose is to manage summer power generation releases from Lake Wallenpaupack to keep water in a six-mile stretch of the Lackawaxen River, downstream of their hydroelectric power plant, below 75° F to mitigate stressful riverine conditions for trout. BSTI deploys and routinely retrieves data from the river probes by accessing the river and connecting a data shuttle and laptop to each probe. BSTI is responsible for safely storing, managing and uploading the data to our client on a time-sensitive schedule along with inspecting and managing routine maintenance of the river probes in order to minimize disruptions to the collection of important river data during the summer. BSTI also inspects the equipment and instruments of a remotely located weather station along the Lackawaxen River that collects continuous atmospheric data used for the thermal programs forecast modeling . The thermal stress relief program is based on statistical forecasts of water temperatures and estimates of the release quantity necessary to maintain the 75° F temperature target. The program has been remarkably effective, and has not caused conflicts with other operating constraints relative to Lake Wallenpaupack. The hydroelectric power plant has fully specified protocols for its thermal releases, which are keyed to air temperatures and river flows using a regression based forecasting model. The river data is used to verify that the program goals are being met and to inform future forecasting models.